January is drawing to a close, and we have continued to win games. We are undefeated this season with a record of 14 wins and two draws. It’s not like we have been crushing teams, just managing to win games. The upshot is that we have now not lost a game in the last 12 months which is a sizable run. “The Major” wishes to leave, and I have no objection to this. Unfortunately he is out of contract and Fiorentina come in and offer him a contract. I offer him out for 100K but nobody bites. Lazio also come in for him. Meanwhile Jeonbuk bail on the deal for “Dobbie”, which costs me a new contract offer as a Marque player. Still I am happy to have tied him down to a long deal as he will be a key player for the team. As expected the board like me. The club isn’t in the best of financial positions, mostly due to our expenses being way less than revenues. The odds in this game are much shorter than they have been in the past. “Trickles” gets us off to a fine start with a nice finish off a “Eyetie” cross. The crossbar preserves our clean sheet, and then some fine saves by “The Greek” are needed. The game has been brutal with fie yellow cards in first 20 mins. Adelaide have had the better chances, but we have the goal. 1-0 at the break. “Dobbie” produces an effort that needs a top save to keep out. “Dobbie” misses a great chance to double the lead. Somehow we manage to hold on, and the early goal proves to be enough. This was a battle for sure. Following the Battle of Adelaide, “Family Man” becomes the first player to be suspended for cumulative yellow cards this season. Young “Dobbie” Dobson picks up a new deal, becoming an Australian Marque player in the process. And just like that, he is off. Nothing I could do about it. I didn’t want to extend his deal now that I have “The Greek” signed for next couple of seasons and I am doubtful that he would have agreed anyhow. Nothing major here with “Gopher” contracting a virus. Its only a matter of a couple of weeks. The Victory have been a tough task for us to get the better of. Even though they have been struggling for results this season we will not take the game lightly. We field a strong side, with only one change being forced upon me with “Family Man” suspended for accumulated yellow cards. “Robbo” comes into the starting team, and “The Axe” to the bench. We hammer away at the door and finally a crack opens. “Warrior” pokes home a corner to open the scoring. “Mr Li” made it two with a nice finish to an “Eyetie” cross. we give one back within a minute and only good keeping by “The Greek” keeps us ahead at the break. “Dobbie” is not having a great game and needs to be watched. “Dobbie” picks himself up and finds the net on the back of a good cross from “Trooper”. “Mr Li” scores a thunderbolt to make it 4-1 and we are in control. “Nerd” and “The Axe” get some playing time. We give up a late goal, but win both halves 2-1. Perth are mid table and this is predicted to be a walk in the park for us. It’s time to rotate a few players and give some of the back-ups some minutes. “Nerd”, “Scruffy”, and The Axe” are all back for this match. “Taffy” is given his debut, while “Family Man” spells “Boothie” for this week. A thoroughly disappointing performance saw neither side good enough to win. The arrival of “Mr Li” and “Trooper” with 20 mins to go increased our chances created but not our goals count. This is the first game where we have failed to score a goal this season. Taffy got to make his first start for the side and performed well. “Gopher” returns to training following his virus. Oh what a difference a few weeks make. They should have had me as manager, and would have done so had they been prepared to wait two more weeks. The club has not been a picture of stability, has it? Luckily “Scruffy” has only been a fringe member of the side this season. Five weeks is a longish time at the business end of the season. We are looking to bounce back with a win this week. The Phoenix have been playing well and can not be taken lightly. “Mr Li” in for the injured “Scruffy”. “The Count” gets a rare start for the season. “C.K.” Drops back to CM as “Warrior” drops to the bench. Well it wasn’t a dominant performance in terms of goals, but a good win none the less. Nerd has been under performing and with his contract up at the end of the season he may be let go. Another month undefeated. 10 points out of 12, and the draw was the only game we have not scored this season. Top of the table by a whopping 14 points. Currently the worst we can finish is 8th should we loses all our remaining games. Games against 2nd placed Mariners and then we have three bottom teams. Our run should continue. 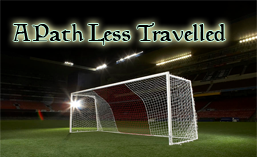 This entry was posted in 2021, A Path Less Travelled, Newcastle Jets, Season 2020/21 and tagged Adelaide United FC, Melbourne Victory FC, Perth Glory FC, Wellington Phoenix FC. Bookmark the permalink.